Metro Super Erecta is the foundation that all of Metro Shelving is built on. With over 32 years of proving itself, Metro Shelving is a name you can count on. Because Super Erecta’s shelves are adjustable on 1″ centers, they can fit any product. Furthermore the open wire design minimizes dust accumulation, allows for increased air circulation and greater visibility of stored items. Additionally, a full choice of casters are available for mobile applications. 24,36,42 and 48″ wide shelves have an 800# capacity per level and 54, 60 and 72″ wide shelves have 600# per level capacity. Finally, all units have a maximum capacity of 2000#. Because Sper Erecta comes in Brite (Polished Zinc), Chrome, Metroseal (Epoxy coating with Microban to retard mold and bacteria), Stainless, White and Black finishes, their is a shelf for all uses. Metro Super Erecta is the foundation that all of Metro Shelving is built on. With over 32 years of proving itself, Metro Shelving is a name you can count on. 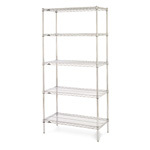 Because Super Erecta's shelves are adjustable on 1" centers, they can fit any product. Furthermore the open wire design minimizes dust accumulation, allows for increased air circulation and greater visibility of stored items. Additionally, a full choice of casters are available for mobile applications. 24,36,42 and 48" wide shelves have an 800# capacity per level and 54, 60 and 72" wide shelves have 600# per level capacity. Finally, all units have a maximum capacity of 2000#. Because Sper Erecta comes in Brite (Polished Zinc), Chrome, Metroseal (Epoxy coating with Microban to retard mold and bacteria), Stainless, White and Black finishes, their is a shelf for all uses.